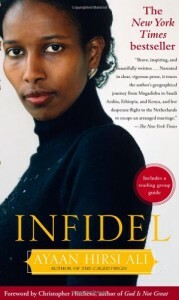 In a recent New York Times interview, 22-year-old Somali Muslim, Ayaan Hirsi Ali, was interviewed about her much anticipated book Infidel, which is being released in English today. The exerpt below explains why “moderate Islam” is an oxymoron. Translation? Islam is, by it’s own definition, a religion of oppression, terror, judgment, and hatred. It is, quite honestly, evil, to be assigned to the manure pile of bankrupt ideologies like Nazism, Stalinism, and Social Darwinism. And it stinks even worse than those. Ali holds out that it can be reformed, but as I discussed in Three Types of Reformation, it can only really be liberalized, which changes it into something wholly other than what it is – just another ethical system with nice metaphors and legends for tepid inspiration. But I guess that’s better than a murderous revealed faith. You can hear the audio of the interview also at the NYT.